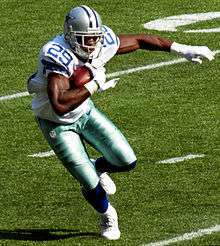 DeMarco Murray (born February 12, 1988) is an American football running back for the Tennessee Titans of the National Football League (NFL). He was drafted by the Dallas Cowboys in the third round of the 2011 NFL Draft and has also played for the Philadelphia Eagles. He played college football at Oklahoma. Murray attended Bishop Gorman High School in Las Vegas, Nevada, where he played football, basketball and ran track. In football, he was an All-conference pick three consecutive years. During his time at Gorman, his team was 3-time Conference Champions. As a senior in 2005, he rushed for 1,947 yards and 27 touchdowns and also caught 22 passes for 624 yards and 7 more scores, earning him All-state honors and the 2005 Sunset Region Offensive Player of the Year award. He also played basketball at Gorman, averaging 6.9 points per game. In track & field, Murray ran the 100-meter dash and was a member of the 4x100-meter relay squad. Considered one of the top running backs of his class, Murray drew offers from Miami (Fl. ), Penn State and Texas A&M, among several others. He chose Oklahoma over Southern California at the 2006 U.S. Army All-American Bowl. Murray redshirted the 2006 NCAA football season. In his first game for the Oklahoma Sooners on September 1, 2007 vs. the North Texas Mean Green, Murray rushed for 87 yards and five touchdowns, becoming the first player to score four touchdowns in a half in his Sooner debut. On September 15, 2007 against Utah State University, Murray entered the Oklahoma football record book when he had a touchdown run of 92 yards, which is the third longest in Oklahoma football history. Murray tied Adrian Peterson's freshman touchdown record in 2007 with 15. He logged a 4.40 (team best) 40 time and a 36.5-inch vertical jump during the 2007 winter testing. On October 16, 2010 Murray passed Steve Owens as the all-time touchdown leader at the University of Oklahoma with 58 touchdowns. He ended his college career with 65 touchdowns, becoming only the fifth player in Big 12 conference history to score at least 60 career touchdowns. Murray had 3,685 career rushing yards (4.86 average) with 50 touchdowns, 157 career catches with 13 touchdowns, and 1,462 kickoff return yards with two touchdowns. Murray was selected in the third round (71st overall) of the 2011 NFL Draft by the Dallas Cowboys. Murray was the sixth running back chosen in the draft after Mark Ingram (1st round from University of Alabama, 28th overall by New Orleans Saints), Ryan Williams (2nd round from Virginia Tech, 38th overall by Arizona Cardinals), Shane Vereen (2nd round from University of California, 56th overall by New England Patriots), Mikel Leshoure (2nd round from University of Illinois, 57th overall by Detroit Lions) and Daniel Thomas (2nd round from Kansas State university, 62nd overall by Miami Dolphins). Murray signed a four-year contract with the Cowboys worth $2.97 million including a signing bonus worth $622,000 on July 29, 2011. DeMarco Murray started the year as the third string running back on the team behind starter Felix Jones and second string running back Tashard Choice. From week one to week four, Murray had 14 carries for 39 rushing yards (2.78 average) and added 3 receptions for 16 receiving yards. On October 16, the Cowboys traveled to Gillette Stadium to face the New England Patriots. Felix Jones went down with a high-ankle sprain, which increased the amount of opportunities for Murray. Murray finished the day with 11 carries for 34 yards and added 1 reception for 7 yards. With the Cowboys owning a record of 2-3, the Cowboys faced the St. Louis Rams in week seven. Felix Jones was declared out for the game due to the high ankle sprain injury sustained the week before. The team declared Tashard Choice as the starter for the game and Murray as the second string running back. Murray ran for 253 yards on 25 carries against the St. Louis Rams breaking Emmitt Smith's single game rushing record for a Cowboys running back of 237 yards (set at Philadelphia against the Eagles on October 31, 1993). The record total included a first-quarter 91-yard touchdown run that is second longest in Cowboys history, after a NFL-record 99-yard run by Tony Dorsett in January 1983. Among the other records he set during this game were a rookie rushing record for a game in club history, previously held by Tony Dorsett (206 yards in 1977). His 10.1 yards-per-carry is the highest rushing average with 20-or-more attempts for a game in club history, previously held by Tony Dorsett (8.96 in 1977), the 10th most rushing yards in a game in league history, the second-most rushing yards in a game by a rookie in league history, second-longest touchdown run on a player’s first career rushing touchdown in league history, and the most rushing yards by a running back in one game ever allowed by the Rams in club history (Los Angeles and Saint Louis). Murray earned the Rookie of the Week award and FedEx Ground NFL Player of the Week for his game against the Rams. After the St. Louis Rams' game, Tashard Choice was released leaving the team with only two healthy running backs, rookie Phillip Tanner and Murray, with Felix Jones still sidelined with an injury. Murray followed his record-breaking game by getting the first start of his career against the Eagles in week nine. In week eight and nine, Murray totaled 30 carries for 213 rushing yards (7.1 average) and 5 receptions for 45 yards. With his second 100+ yard rushing game of the season, Murray became the first Cowboy since Julius Jones in 2004 to post multiple 100+ yard rushing games as a rookie. With 466 rushing yards over the last three games, Murray tied Eric Dickerson for the fifth-highest total all-time by an NFL rookie during a three-game span. The record is 577 set by Mike Anderson of the Denver Broncos in 2000. The 466 rushing yards in the three game span is the most ever by any Cowboys player, surpassing 446 yards by Emmitt Smith during his MVP season of 1993. From week ten to week thirteen, Murray had a total of 79 carries for 333 rushing yards (4.21 rushing average) and added 16 receptions for 109 receiving yards and one rushing touchdown as the Cowboys went 3-1 during this stretch. In week ten against the Buffalo Bills, Murray fumbled the ball for the first time in his professional career, although the fumble was recovered by Murray himself. In week fourteen vs. the New York Giants, Murray carried the ball 5 times for 25 yards and added one reception for 6 yards before suffering a fractured right ankle and high ankle sprain that ended his rookie season. Murray was named NFL Rookie of the Month for the month of November. At the end of the 2011 season, Murray led all NFL rookie players (with 40 or more carries) in average per carry (5.5 per carry), yards per game (69.0 yards) and rushing yards (897 yards) on 164 carries (second most among rookie players, Daniel Thomas had 165 carries). Murray tied for third among rookie players for rushing touchdowns with 2; Carolina Panthers' quarterback and 2011 Rookie of the Year Cam Newton led all rookie players with 14 rushing touchdowns. Murray also was 14th in receptions among all rookie players and 2nd among rookie running backs with 26 receptions. He was also 4th in receiving yards among rookie running backs with 183. Among all NFL running backs, Murray with 7 starts in 12 games, tied for the second highest average per carry for a running back with 80 or more carries trailing only Darren Sproles' 6.9 yards per carry on 63 attempts. Murray's 897 rushing yards ranked 22nd among all NFL running backs and 9th in the NFC.The Cowboys went 5-0 for the season when Murray received 20+ touches in the game and 2-5 when he did not. In the five games where Murray got 20 or more touches, starting quarterback Tony Romo averaged a passer rating of 112.10, 246.6 yards per game, along with 12 combined touchdown passes with 2 interceptions and a 66.99% pass completion rate. Murray in 2012 vs. the Seahawks. In week 6 against the Baltimore Ravens, Murray rushed for a 93-yard performance on 14 carries before suffering a sprained foot. He would miss 6 games. 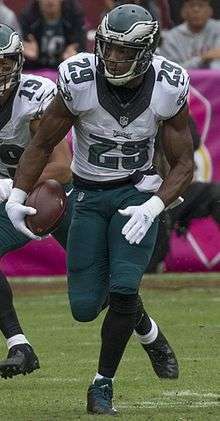 In week 13, after returning from his injury, Murray rushed his way to 83 yards and one touchdown on 23 carries against the Philadelphia Eagles. In week 14 against the Cincinnati Bengals, Murray recorded his 3rd touchdown of the year while rushing for only 53 yards on 21 attempts. This marks the eighth straight game where the Cowboys have won with Murray rushing the ball 20 or more times as the starting running back. Despite playing in just 10 games, Murray finished the season with 161 carries for 663 yards, for a career-low average of 4.1 yards per carry. He also had 251 receiving yards on 35 receptions. He had 4 TDs. In week 3, the second time DeMarco Murray played the St. Louis Rams in his 3-year career, he totaled 203 yards from scrimmage and one touchdown. Murray recorded 175 yards on 26 carries and 28 from 3 catches. This marks the second time in as many games he has run for over 175 yards against the St. Louis Defense. In week 6 game against division rivals the Washington Redskins, Murray suffered a sprained MCL, and missed the next two games. Rookie Joseph Randle took Murray's place, because second string running back Lance Dunbar was also battling an injury of his own. Returning from injury in week 9, he carried only 4 times for 31 yards as the Dallas coaching staff abandoned the running game completely. Although he didn't have many opportunities in this game, Murray really got things going from here on, as 61% of his rushing yards came from the second half of the season. Murray at the 2014 Pro Bowl. After the last game of the season, Murray was fined $21,000 for violating the crown-of-the-helmet rule on a collision with Eagles' defensive lineman Damion Square. Murray finished the productive season ranked 11th in total yards from scrimmage with 1,471, while missing 2 games due to injury. He had 217 carries for 1,121 yards and 9 touchdowns, all career highs and ranking (T)17th, 10th and (T)6th respectively among running backs. His 5.2 yards per attempt was the most in the league among players with 150 or more attempts. He also recorded 53 catches for 350 yards and one touchdown, ranking 11th, 14th and (T)16th among backs. Murray replaced an injured Frank Gore to play in the 2014 Pro Bowl, after Gore got injured during the NFC Championship game against the Seattle Seahawks. This marked his first Pro Bowl since joining the league in 2011. He ran 4 times for 25 yards and caught 4 passes for another 37 yards as he scored the eventual game-winning touchdown on a 20-yard reception by Kansas City's Alex Smith to give Team Rice the 22-21 win. In 2014, the Cowboys entered the year with many questions and doubts about its future. After losing the season opener, Murray and an improved offensive line helped the team find a new identity. In the first 8 games, Murray broke Jim Brown's 1958 NFL rushing record for most consecutive 100-yard games to start a season. Given his previous injury history, the team considered limiting some of his workload, but he was such an integral part of the offense success, that the Cowboys could not cut back on his playing time. In week 15 against the Philadelphia Eagles, he suffered a broken left hand that required surgery the following day. Heavily bandaged, he didn't miss any time and played the following week against the Indianapolis Colts. In week 17, with his hand still bandaged, he rushed for 100 yards to pass Emmitt Smith's Cowboys franchise single season rushing record with 1,845 yards. Although he experienced great success and was in the league's MVP conversation, he battled fumbling problems, which included a key fumble in the divisional playoff loss against the Green Bay Packers. Murray set the franchise single season rushing record with 12 games rushing 100+ yards and passed Walt Garrison for seventh on the Cowboys all-time rushing yards list. He also finished the season as the league's top rusher. He was named to his second Pro Bowl, while having his second straight 1,000 yard season. On March 9, 2015, it was reported in the media that Frank Gore had agreed in principle to a contract with the Philadelphia Eagles to replace LeSean McCoy, who was recently traded to the Buffalo Bills. However, the following day Gore had second thoughts and signed instead with the Indianapolis Colts. Following this setback, the team reached an agreement with Ryan Mathews for a three-year deal. However, the Eagles quickly turned their attention into also signing the NFL rushing champion Murray, who was still available in free agency. On March 12, he agreed to a five-year $42 million contract, joining his former college teammate, quarterback Sam Bradford. In his first game with the Eagles, Murray scored 2 touchdowns, an 8-yard run and a 5-yard reception. He received criticism because he rushed 8 times for only 9 yards, while catching 4 passes for 11 yards. In week 2 against his former team the Dallas Cowboys, he was held up again, rushing for 2 yards on 13 carries and catching 5 passes for 53 yards in a 20-10 loss. He missed week 3 due to a hamstring injury, while Mathews ran for 108 yards and Darren Sproles scored 2 touchdowns. Despite Mathews' success, Murray was named the starter in a divisional matchup with the Washington Redskins. He had a 30-yard run in the first quarter, but finished the game with 8 carries for 36 yards. On October 19, in a 27-7 win over the New York Giants, Murray rushed for 109 yards and a touchdown on 22 carries, which turned out to be his only 100-yard game of the season. As the weeks progressed, Murray grew increasingly frustrated, with the offensive line not generating the running lanes needed, being required to frequently run laterally instead of downhill and not being seen as a good fit in the team's offensive system, which always ran in the shotgun. In the week 13 game against the New England Patriots, he was demoted because the team decided the smaller, quicker Darren Sproles would be more effective. Murray registered 8 carries for 24 yards in the game, while Sproles recorded 66 rushing yards on 15 carries, and 34 yards on 4 catches. Murray reportedly had a conversation with owner Jeffrey Lurie over his role in the offense during the flight back to Philadelphia. Murray struggled to get touches after the return of Ryan Mathews who started the remaining 4 games. Murray finished third on the team in rushing in the next 2 games, behind Sproles and Mathews, posting only eight snaps with two rushing attempts against the Arizona Cardinals. He led the team in carries and rushes in a Week 16 matchup against the Redskins (5 carries for 27 yards and a TD), he fumbled a pitch that was returned for a touchdown just when the Eagles started to make a comeback. Going into the last game of the season, head coach Chip Kelly was fired and offensive coordinator Pat Shurmur became the interim head coach. Murray rushed for a 54-yard touchdown on his first carry, and finished the game with a 5.8 yards per carry average, his highest of the year. He finished the year with only 702 rushing yards, and had only two games with over 20 carries, his lowest output since 2012. On March 9, 2016, Murray was traded to the Tennessee Titans along with the Eagles' 2016 4th round draft pick, in exchange for the Titans' 2016 4th round draft pick. On June 20, 2013, actress Heidi Mueller gave birth to DeMarco Murray's first child, a daughter, Savanna June. The couple announced their engagement on January 19, 2015. ↑ "DeMarco Murray NCAA stats". Sports-Reference.com. ↑ "Adrian Peterson-Oklahoma RB-2007 NFL Draft Scout Player Profile". Nfldraftscout.com. Retrieved November 28, 2008. ↑ "2011 NFL Draft". NFL.com. Retrieved November 28, 2015. ↑ NFL.com. "2011 NFL Game Summary - Dallas Cowboys @ New England Patriots" (PDF). NFL.com. Retrieved November 8, 2011. ↑ NFL.com. "2011 Game Logs - DeMarco Murray". NFL.com. Retrieved November 28, 2011. ↑ Dallascowboys101.com. "When Comparing Demarco Murray and Felix Jones, There's Really No Comparison". dallascowboys101.com.com. Retrieved September 12, 2011. ↑ NFL.com. "2011 NFL Game Summary - St. Louis Rams @ Dallas Cowboys" (PDF). NFL.com. Retrieved December 14, 2011. ↑ Ellis, Josh. "Nowhere To Run - Murray Starts, Excels, But Carries Decrease". DallasCowboys.com. DallasCowboys.com. Retrieved November 3, 2011. ↑ NFL Game Summary. "NFL Game Summary - Dallas Cowboys at Philadelphia Eagles" (PDF). NFL.com. NFL.com. Retrieved November 3, 2011. ↑ NFL Game Summary. "NFL Game Summary - Seattle Seahawks at Dallas Cowboys" (PDF). NFL.com. NFL.com. Retrieved November 7, 2011. ↑ Daniels, Kurt. "Honored Victory - Dallas Defeats Seattle Seahawks, 23-13". DallasCowboys.com. DallasCowboys.com. Retrieved November 7, 2011. 1 2 Eatman, Nick. "Gameday Notebook Notes: Punter Shines; Lee Eyes Next Week". DallasCowboys.com. DallasCowboys.com. Retrieved November 7, 2011. ↑ NFL Game Summary. "NFL Game Summary - Buffalo Bills at Dallas Cowboys" (PDF). NFL.com. NFL.com. Retrieved November 14, 2011. ↑ NFL Game Summary. "NFL Game Summary - Dallas Cowboys at Washington Redskins" (PDF). NFL.com. NFL.com. Retrieved November 28, 2011. ↑ NFL Game Summary. "NFL Game Summary - Miami Dolphins at Dallas Cowboys" (PDF). NFL.com. NFL.com. Retrieved November 28, 2011. ↑ NFL Game Summary. "NFL Game Summary - Dallas Cowboys at Arizona Cardinals" (PDF). NFL.com. NFL.com. Retrieved December 5, 2011. ↑ NFL Game Summary. "NFL Game Summary - New York Giants at Dallas Cowboys" (PDF). NFL.com. NFL.com. Retrieved December 5, 2011. ↑ Phillips, Rob. "Murray, Church To IR; Morris, New Safety Signed". DallasCowboys.com. DallasCowboys.com. Retrieved December 14, 2011. ↑ Florio, Mike. "DeMarco". NBC Sports. Profootballtalk.com. Retrieved May 3, 2012. ↑ NFL.com. "NFL 2011 Regular Season Rushing Statistics". NFL.com. NFL.com. Retrieved November 29, 2011. ↑ "DeMarco Murray to sign with Eagles". ESPN. Retrieved 12 March 2015. ↑ "It's Official: RB Murray Signs With Eagles". PhiladelphiaEagles.com. March 12, 2015. Retrieved March 12, 2015. ↑ "Demarco Murray". NFL. National Football League. Retrieved 27 December 2015. ↑ "Titans to acquire RB DeMarco Murray from Eagles". NFL.com. ↑ "DeMarco Murray NFL stats". Pro-Football-Reference.com. ↑ "Actress Heidi Mueller Announces Engagement to Cowboys RB Demarco Murray". cowboysblog.dallasnews.com. Retrieved March 11, 2015. 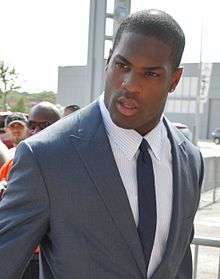 Wikimedia Commons has media related to DeMarco Murray.